The Elvis Presley Forever postage stamp is a part of the Music Icons series issued by the United States Postal Service. It features Presley in a 1955 black and white photography taken by William Speer. The design created by Antonio Alcalá and Leslie Badani also features a golden crown and the signature of Presley on the side. The stamp was dedicated on August 12, 2015 during a ceremony in Graceland, attended by Priscilla Presley and Postmaster General Megan Brennan. The release of the stamp was accompanied by a hit compilation album, Elvis Forever, sold through post offices around the United States and on the internet. Other than the Rev. Martin Luther King and several US Presidents, Elvis Presley is the only US national who has been the subject of two commemorative stamps by the USPS. The first was issued in 1993. The first stamps, and earliest known use (EKU), were purchased August 10, 2015 at the Mason, Tennessee post office by stamp collector David Saks. ↑ "Elvis Presley Forever". USPS Store. United States Postal Service. Retrieved August 28, 2015. ↑ "Elvis Presley 'Forever' Stamp Goes on Sale This Week". Associated Press. Billboard. August 13, 2015. Retrieved August 28, 2015. 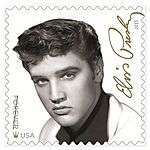 ↑ "Postal Service Previews Elvis Presley Forever Stamp". Graceland.com. Elvis Presley Enterprises. July 2, 2015. Retrieved August 28, 2015. ↑ "2 Days Early, Collector Buys Sheets of New Elvis Presley Stamps". CommercialAppeal.Com. Journal Media Group. August 10, 2015. Retrieved November 6, 2015. ↑ "Elvis Presley Stamps Sold Early in Tennessee". Linns.Com. Amos Press Inc. August 11, 2015. Retrieved November 6, 2015. ↑ "A Stamp Collector Managed to Buy Elvis Presley Philatelic Items Before the Official Ceremony of Their Issuing". StampNews.Com. Stamp Collecting News. August 22, 2015. Retrieved November 6, 2015.